The only thing real about this play is the author's love for a certain band — note on title page of program. The little note tucked in at the bottom of the program's page of credit details neatly sums up Amy Staats's raison d'être for writing Eddie and Dave, now in its world premiere at the Atlantic Theater's Stage 2 on West 16th Street. It admits that this is a very thinly disguised bio-play about the famous 80s rock band, Van Halen. 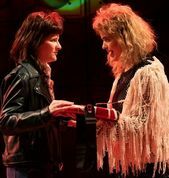 The title uses only the first names of the band's guitarist and songwriter Eddie Van Halen and its on and off-again colorful lead singer David Lee Roth, both of whom are the play's pivotal characters. Van Halen is something of a historic more than active super successful band these days. But the Van Halen brothers and David Lee Roth are still alive. And, while their music is still widely loved, it took a fan like Amy Staats to turn that love into this affectionately imagined trek through more than half a century of the Van Halens' and Roth's personal and professional history. That brief, small print program note about the only thing real about Eddie and Dave being the author's love for "a certain band" is probably intended to forestall legal squabbles. To further validate it as a work of imagination, Staate has structured it to be narrated by MTVVJ who's witnessed all phases of these musicians' journey. . . making it that narrator's own memory play. . . and taking plenty of liberties with the Van Halens' and Roth's real histories. But what if you're not a Van Halen fan? Is this fictionalized, comic take with its focus on the tumultuous relationship between Eddie Van Halen and David Lee Roth likely to be meaningful and entertaining? As someone who isn't a fan and who knows little or nothing about this band, I'd say "no" in answer that meaningful question with but "yes" as to whether it's entertaining. Ms. Staat's story telling gimmick of using that MTV narrator works well to make her semi-biographical story quite colorful and amusing. And director Margot Bordelon's moves us smoothly through the band's back story— starting with the Dutch Van Halen brothers gigs as classical kid musicians and ending with them as well as David Lee Roth and even our versatile narrator in their 60s (as that narrator assures the younger members in the audience, they too will be). These positives notwithstanding, I would revise that program note as follows: Unless you love this band as much as Amy Staats does, Eddie and Dave is too imperfect to be one of the season's indisputable must-sees. Even at just 90 minutes, it feels about ten minutes too long. The only real reason to ignore my reservations and enjoy it — and that's not a bad reason to do so — is the novelty of the gender switching casting. Granted, we've recently seen stellar female King Lears and Hamlets, but I don't recall any female actors playing male rock stars. But playwright Amy Staat displays strong acting chops as Eddie, and Megan Hill is a wonderfully vivid, over-the-top as Dave. Adina Verson is also convincing as Eddie's brother AJ. Turning the tables on the gender switch, Omer Abbas Salem is a knockout as Eddie's wife Val (another true to real life character, Eddie's first wife actress Valerie Bertinelli). Though the narrator could be any gender, it makes sense to have a female VJ, especially since Vanessa Aspillaga not only inhabits that role fully but effortlessly slips into various other characters— including a hilarious Quincy Jones and Michael Jackson. Ultimately, Staats has her, along with the other characters greatly changed at the end of her play's 90 minutes. To conclude, Eddie and Dave didn't convert me into a Johnny-come-lately Van Halen enthusiast. In fact, I found Michael Thurber's soft incidental music a lot more pleasing to the ear than the loud recorded music before the play and a few times during the play. I don't think I would have found as much of this entertaining without the cross-gender casting. However, Amy Staats has managed to prove that everyone, even rock stars, must deal with professional and private relationships, insecurities, health issues and fading careers.
. Cast: Vanessa Aspillaga, Megan Hill(MTV/V & various other characters including Quincy Jones, Sammy Hagar, Michael Jackson), Amy Saats (Eddie), Omer Abbas Salem (Val) Al (Adina Verson).